Shammi Kapoor had fun in front of the camera. He endowed films with a lightness and joy that even Dev Anand couldn't match. Dev Anand was always striking a pose, whereas Shammi Kapoor added something unpredictable to each frame that the director had clearly not imagined. Which director could conceive such twisting and writhing, such contorted gestures, anyway? Kapoor put his heroines to shame, and every Bollywood actress before and since. Often graceful, sometimes ungainly, his unselfconsciousness about his body was rare, if not unique, in Indian cinema; and the craziness of his imagination was surpassed only by that of Kishore Kumar. 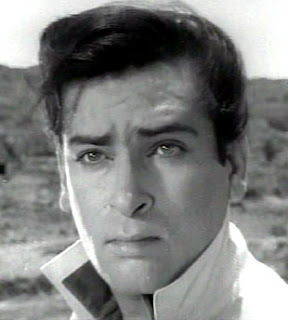 Shammi Kapoor did not fear appearing ridiculous, and was criticised in his time for being ridiculous. The intelligentsia looked down on his movies, till the vogue for popular culture studies forced the sons and daughters of Shammi Kapoor-castigators to take a second look at his films. What they found was something so weird and inimitable, it could not date in the manner of the acting style of his contemporaries. It's instructive that English news channels are today giving his death significantly more space than are Hindi broadcasters. It's not like the Hindi channels don't go for pop culture; quite the contrary. But they are interested more in contemporary scandal of the kind the Rakhi Sawants of the world provide than in retro-nostalgia with a touch of fond irony. All the Kapoors have a tendency to get fat, and Shammi Kapoor's career was effectively ended by obesity. He appeared in films through the 1970s and 1980s, but his roles were uniformly forgettable, for he had relatively little talent as a dramatic actor. It was what he did with his body in his heyday that was captivating. Amen. Only Shammi Kapoor could've pulled out the "Yahooooo!" song. And he did it with what electricity. One of my favorite stars of all times. RIP.